Take your class on a journey and travel with us during the migration of the monarch butterfly (Danaus plexippus). This migration is one of the most spectacular events in the insect work, and every year, millions of delicate but hardy monarchs and their offspring travel thousands of miles from Canada and the United States to overwinter in just a few mountain peaks in the states of Mexico and Michoacán, Mexico. This magical journey has also been deemed an “endangered natural phenomenon.” Monarch butterflies are dependent on conservation of habitats in all three North American countries – United States, Canada, and Mexico. explore the electronic field trips listed below. These programs were broadcast/webcast live and are now archived as streaming video on this web site. Join us in Virginia as we kick off Monarch Live. This program reviews monarch biology, citizen science programs, and the importance of stewardship. Join in the first ever live webcast and satellite broadcast from the Monarch Butterfly Biosphere Reserve. Biologists discuss the monarchs’ overwintering habitat and biology. Visit with local people living in the monarch butterfly region who are involved in conservation and developing sustainable livelihoods. The program will be broadcast and webcast from Alternare, a non-profit organization that works in close partnership with campesinos in the monarch wintering areas to promote sustainable and adequate food production, forest conservation, and environmentally sound economic activities. Butterfly gardens can be created everywhere! Learn how small garden plots can have big results for both butterflies and people at Eden Place in Chicago. Visit Minnesota to learn about monarchs’ summer behavior and population growth, citizen roles in monitoring the population, and threats to monarchs. Monarchs depend on healthy habitats in three countries, and Canada provides a welcome summer home to thousands. 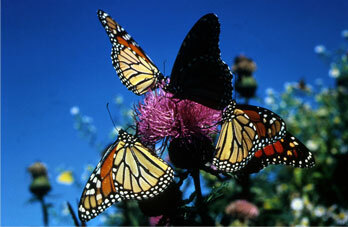 CLICK HERE for a PowerPoint presentation about Monarchs in Canada and Point Pelee National Park. NPS, and NRCS) and broadcast by the U.S. Fish and Wildlife Service. Presenters include: Sandy Frost, U.S. Forest Service; Kristy Liercke, Prince William Network; Kathy McGlauflin, Project Learning Tree; Donita Cotter, U.S. Fish and Wildlife Service; and Randy Robinson, U.S. Fish and Wildlife Service.